It was the day before exchange. I had promised my mother I would take her in for a small cancer operation and, as a dutiful son, I duly obliged and drove down to Poole. I sat with her until she went under then decided that, while she was not contactable, I would go for a long walk. 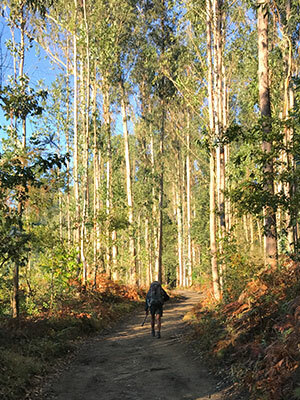 Long in the 20k sense but nothing like as long as the walk I had planned for the next week – doing a stretch of the Camino with my girlfriend. Why? Because part of the selling-my-company deal was to find more personal space to enjoy time with her. I carried on walking. And hour went by and the phone didn’t ring. An email came in with a “can you read this” appeal and, having regained some headspace (or was it a sense of release? ), I heard my head say, “this can wait”. I went back into the rhythm of walking, just as it had been during my last Camino. My watch interrupted, annoyingly, by giving me my stats every km when all I wanted to do was sink into the euphoria of my uncontactless-ness. I got to the 10k point and phoned the girlfriend and said, “Next week, on Camino, it’s no watches. They spoil the ambience”. After 15ks I ignored two calls from the advisors then took a call from my business partner. He asked how my mum was and I said, “Sleeping as the op was still running”. He said, “We are nearly there on the contract”. But I was still pissed off as the latest deal on the table would mean losing 1.25%. Yes, that’s how uptight I had become. I said, “Leave it to me. I’ll sort it,” without being sure whether I would pull out or try to keep banging against the brick wall, determined not to lose this one large (actually small) aspect of the deal. The phone rang again and I was told that my mother could be picked up in an hour but that they would ring again to confirm. I had to get home, shower and get ready to set off. There was no time to lose. I got home, undressed and headed for the shower. I was about to step under the spray when the office texted to say the phone lines were down and the IT had failed. It was 5.15pm and I was naked but, and this is typical me, I called the office manager and arranged for all calls to be put through to my mobile as everyone would be going home soon. At 5.25pm I got in the shower and, yes, the phone rang again. And again. I was, in effect, my own receptionist taking call after call, stepping in and out of the shower stream, not showering, just getting wet, while telling everyone we would call them back tomorrow. I couldn’t wash, the hospital couldn’t call and, most annoying of all, I couldn’t shout at my advisors to carry on trying to win 1.5% of a deal. At that moment I thought, “I am 56. I am standing naked in a shower answering calls for my staff and unable to contact my sick mother. What the f**k am I doing?” Fifteen minutes later I had agreed the deal and was sitting beside my mother with my life regained. So what is the result and indeed the moral of this story ?? On the 8th October it was announced to the Stock Exchange of the forthcoming sale of Azule to PCF Bank. Good news for the shareholders and for our existing and future customers as this sale will allow us to both, increase our range of services to the market, and also offer funds from a lower cost of funds. So effectively enabling our customers to borrow at better rates than we were offering prior to the sale, without hindering our flexibility that we have or had as brokers. Good news for all. I suppose I am trying to say that many of us end up in positions where we can’t see the wood for the trees, everything becomes so microscopically focused that all the small problems become big problems. It is at this stage you have to take stock and ask, what really matters to you in life. Today as finishing this article I had a member of my staff talking to me about her mother’s illness, worse than my mothers. Then you think that REALLY matters, these things outside of business are more important than whether you make another few thousand on a deal. So heading back to the top I have just finished by second Camino, no phone or internet let alone watch and am hopefully a 56 year with a much more balanced perspective on life. If you want to talk through work life balance or any of the topics above contact me on 07834 864958 peter.savage@azule.co.uk and remember DON’T sweat on the small Stuff !!!!!!!!! !